Chances are you’ll have heard a tube amplifier and never noticed it, and invariably it would have been at a live gig. Musicians have for years chosen the richness and pleasing second-order distortion characteristics of tubes over transistors, because they give a rawness and dynamic sound that solid state devices have only really hinted at. So why not recreate some of this tube magic in the safety and comfort of your own home? As with vinyl, the tube revival is gathering pace among music lovers and audio freaks alike, but it might surprise that the onslaught is being led by the Chinese. Yarland is a prime example of the new breed of Chinese tube amp manufacturers for whom quality and reasonable prices coexist in a blaze of glowing lights and real wood finishes. After I cajoled, pleaded and pestered ceaselessly, the local importer allowed me to lug its flagship – the Pro88IISA – home to my man-cave for a sustained listening session. All 29kgs of it. Once home, I removed the Yarland from its cardboard sarcophagus and stood back in admiration: it certainly ain’t no boring black box, and the sheer quality of finish and the combination new/old-world aesthetic would make the amplifier a great centrepiece and talking point in most homes. With a conservative rating of 38 Class-A watts per side, the hand built Pro88IISA is equipped with a compliment of KT88 power, 12AX7 and 6N8P preamp tubes along with 2 x grid EL84’s, and as a testament to simplicity three RCA inputs are provided for CD/LINE and AUX. Either 4 or 8 Ohm speakers can be connected (not at the same time though), and the tubes can be adjusted for bias from the sturdy brushed satin black top chassis plate. With an on/off switch, input selector and volume knob the only protrusions from the wooden fascia, the visual drama really kicked in once connected and turned on – especially with the lights turned off, as I was treated to a riot of elegant glowing tubes. Yum-yum. Now, 38 watts doesn’t sound like a real ton of energy, but once powered and warmed up the Pro88IISA was able to develop real bass grunt along with a warm, open mid-band. In fact, they could power most speakers on the market – just remember to set the impedance correctly when connecting speakers to amp. Class A operation means the amp is effectively running flat out even if not playing music (the volume control is just a ‘gain’ control), so unlike most amps on the market will generate a lot of heat. Allow plenty of ventilation, and don’t touch the tubes! Tracks from Goldfrapp’s new synth-pop inspired album Head First impressed, the driving beat combining with Alison’s vocals and ‘80s synth sounds to great effect. Swapping from CD to my Logitech Squeezebox and Mac Mini saw The Cinematic Orchestra enter my musical radar with their luxuriant Man With A Movie Camera, and this CD-quality rip sounded quite superb. Subtle percussion sounds such as the congas and ride cymbal on ‘The Awakening of A Woman’ sounded ultra-realistic and palpable, while the plaintive alto sax and double bass combo on ‘Postlude’ really pushed all my late-night smoky jazz bar buttons. Through the couple of months I had the Yarland I played everything from Bob Marley to Boards Of Canada, lashings of Nick Cave and the Bad Seeds and a tsunami of Porcupine Tree, Tom Waits, Herbie Hancock, The Stones and Pantera. And everything sounded just right. It’s a kick-arse amp and although not a budget number, it’s worth the moolah. 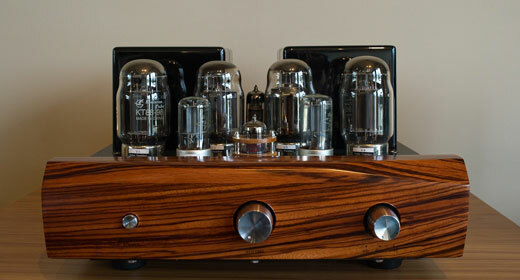 Luckily for those with more modest budgets, Yarland tube amps start at a wallet-friendly $899. Go get ‘em! What a great review! Look forward to many more like it!